Suzanna Gallina, the owner and head farmer of "A Very Small Farm." It wouldn't do justice to try and detail exactly how special and educational my experience was at A Very Small Farm, but to put it into just a few words, Suzanna opened a treasure chest filled with farming and life gems that I will cherish and plan on using as my journey continues. I was only there a few days, but it managed to feel like a few months. Each task we tackled together, I found myself in the most interesting classroom I've ever sat in. An artist turned professor/farmer and everything else she chooses to be, Suzanna and her family run A Very Small Farm to transform the perception that efficient farming must be done on a large scale. Suzanna is a leader by example as she helps other people realize their own potential in an effort to live self-sufficiently through simple sustainable urban farming techniques. They have been turning the small medieval town of Spello into a fully sustainable small urban farming model for cities all across the globe. With a true understanding and belief in sustainability, Suzanna helped me realize the true possibilities of sustainable urban farming. More on Suzanna and her knowledge dropping later, now let's get back to the berries. So what makes these berries so unique? Well Suzanna patiently explained that they, along with other woody plants i.e. sage, rosemary, thyme have what are called undifferentiated cells, which means that the cells found in the plant are genetically coded to produce any part of the plant that needs to be reproduced in case of an injury. This differs from differentiated cells found in animals such as us humans. Differentiated cells have one specific purpose and one only, so when a hand is cut the cells know to help the hand heal itself with "hand cells". These woody plants, blackberries and raspberries in our case, have undifferentiated cells that can produce a leaf if a leave is ripped off or a root if a root is severed, but they can also produce a root if a leaf is cut off and sunlight is blocked as well. This is what we were about to experiment with on a blackberry plant. According to Wikipedia, Totipotency is the ability of a single cell to to divide and produce all the differentiated cells in an organism. This is what will be occurring. 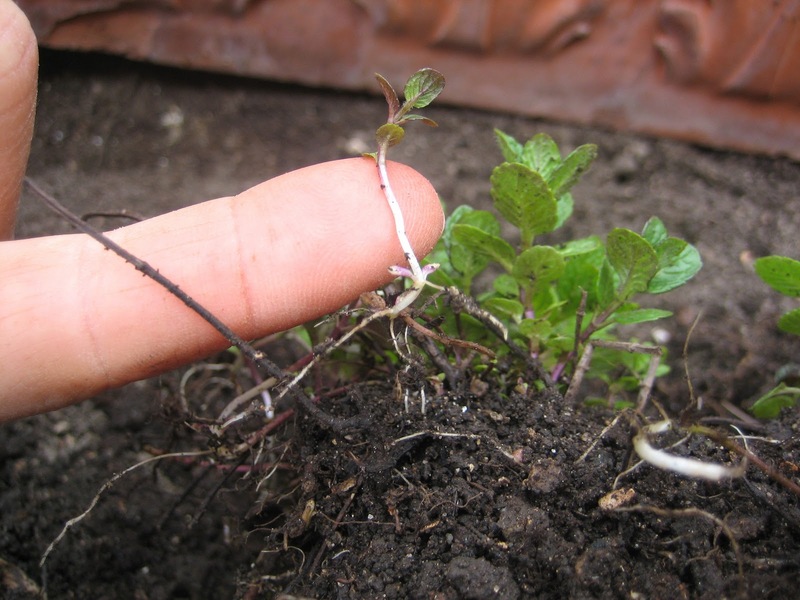 By taking one blackberry plant, tearing off the leaves and burying it underground horizontally, as displayed in the diagram above, we would be able to trick the plant into producing roots where each leaf was severed. From an economic standpoint, this is genius. Instead of buying 20 different plants, you can buy one and turn it into 20 plants. Diagrams are nice, but how lucky was I, not only would I get a chance to horizontally plant a blackberry, but Suzanna also had some leftover raspberries in her garden from last year that had already started to sprout many new raspberry plants. It was like watching a cooking show where they stick the roast in the oven and in the snap of a time lapsed finger, pull it right out exactly as promised. 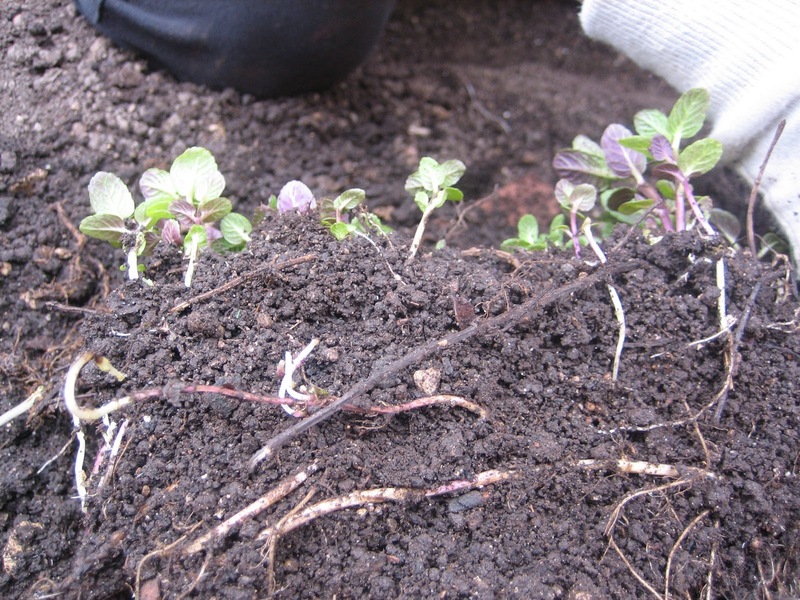 If you click on the pictures below you can really see that all the mini green raspberry plants are attached by a common root stem buried in the dirt. Behind this big, beatiful walnut tree, I would dig a trench to burry the blackberry plant. First we measure the length of the Blackberry, then I got to digging. 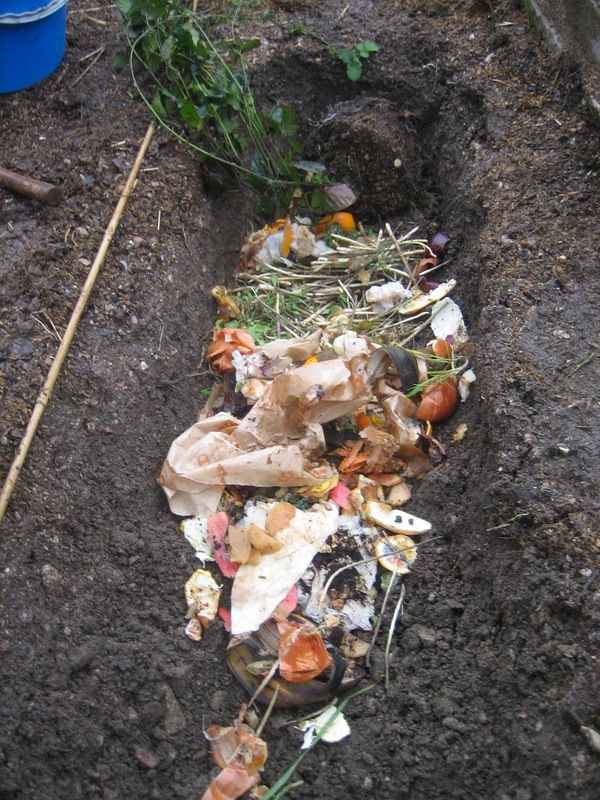 Once we saw that it would fit, Suzanna explained the importance of placing a layer of compost where the current root system would lie followed by a string of completely raw garbage (organic matter only of course) since we all know, there is no waste, only potential. It's important to maintain the original root structure so the plant doesn't die. Over the garbage, goes a thin layer of soil, which I purposely compressed by walking over it. Then a layer of compost with worms! Red worms are a must, a composter's true best friend as these little slimy dudes help breakdown the organic matter as well as aerate the soil. Another thin layer of soil, which the blackberry stems are spaced over. Finally, we took off the leaves and cover it back up with the last layer of soil so it looks as if nothing ever happened. Nevertheless, in a few months, 20 or 30 little mini blackberry plants will hopefully navigate their way to the surface at which time, Suzanna and her WWOOFer helpers will remove and separate them from their common stem bond. This way they can be sold as individual plants or replanted on their own to fruit. Suzanna pointed to this node, where the original blackberry leaf was ripped off. This is the spot where a new root system will develop as soon as the plant realizes there is no direct sunlight. So just like a human, the blackberry plant will send signals that something is wrong at the point of disruption, but since the plant is buried underground, there will be no sunlight. When the reproducing cells get to the scene of the accident they will be confused that there is no sunlight and determine that they must produce a root system and grow upward toward the light. Very cool stuff. Just goes to show you, just how alive and intelligent plants really are. They can really dig themselves out of a hole. One day there will be plenty of fresh blackberries growing just like this one here.